Have you ever seen a slipping grade? You probably have, but might not have recognized it for what it is: a serious stability issue. Slipping grades occur in hillsides and slopes where the sides cannot support the weight at the top. Worsened by erosion, the slope actually breaks and begins to collapse in on itself – bad news for whatever is on top. 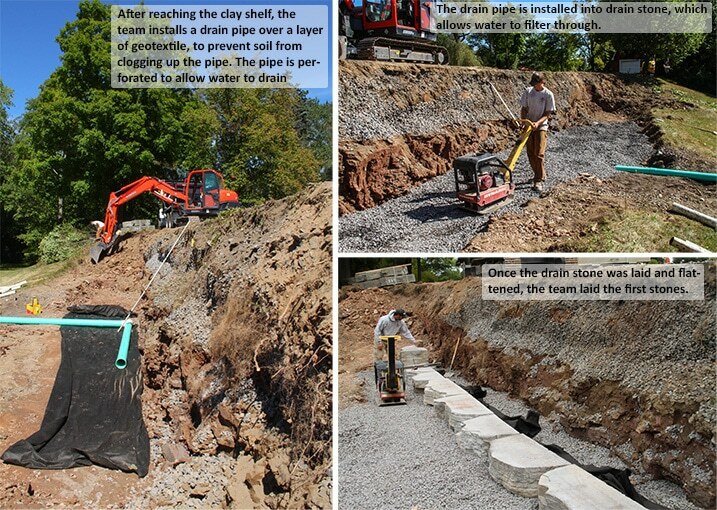 One of the best ways to deal with a slipping grade is the installation of a retaining wall with a French drain. 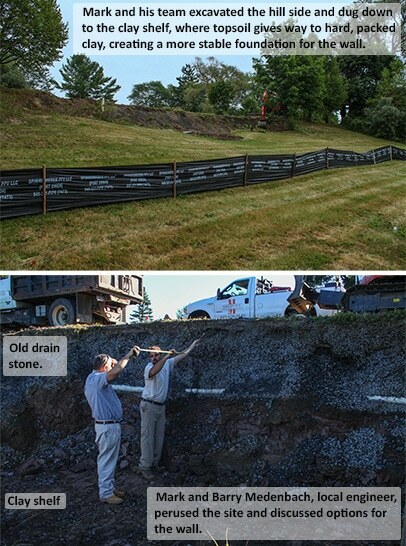 Though basic retaining walls can fix the problem temporarily, a long term solution requires a drain. While the wall stabilizes the hillside, the drain relocates stormwater to keep the hill and wall from warping further. A French drain is ideal, as they are long lasting, and have a low environmental impact, since they don’t redirect water to sewage lines. So, have a suspicious hill in your backyard? A deteriorating bank? This might be the solution you’re looking for. In early September, the owners of the Retired Culinarians Institute in New Paltz noticed they had a slipping grade in the back of their property, on a hillside facing the Wallkill River. The deteriorating hillside was beginning to cause concern for driveway that ran right beside it. Though the affected area had been planted with trees and shrubs and filled in with boulders, erosion and pressure were continuing to warp the hill. The owners called Masseo Landscape Inc., and Mark and the team headed over. After some initial observations, they determined the best solution for a problem this size was a retaining wall with a French drain. First, the team fired up the Kubota KX080-3 and excavated the site. The trees and shrubs were discarded, and the boulders were removed to the entrance of the property as decoration. Then, they dug down to the clay shelf, where soil is replaced by hard, packed clay. The clay would provide a solid, stable foundation for the wall. Local engineer Barry Medenbach stopped by, and after surveying the site with Mark and giving them some building advice, construction began. Drainage was next, because without a proper drainage system, a retaining wall would be useless. Mark and the team are Stormwater Management Certified, so they knew just what to do. An SDR32 perforated drain pipe was installed into a layer of drain stone, and covered with geotextile. Drain stone would allow water to filter through into the drain pipe. The pipe, pitched to an angle, would collect water from the hillside and allow it to drain out, rather than build up and eventually warp the wall. 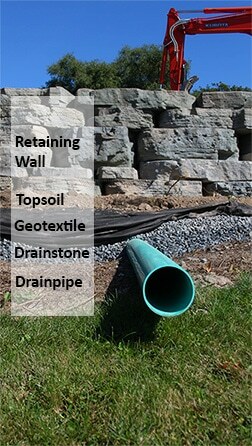 The geotextile on top creates a semi-permeable barrier, allowing water through but keeping out debris and dirt that could clog the drain or the drain stone. After the drainage was in place, the first stones were laid. 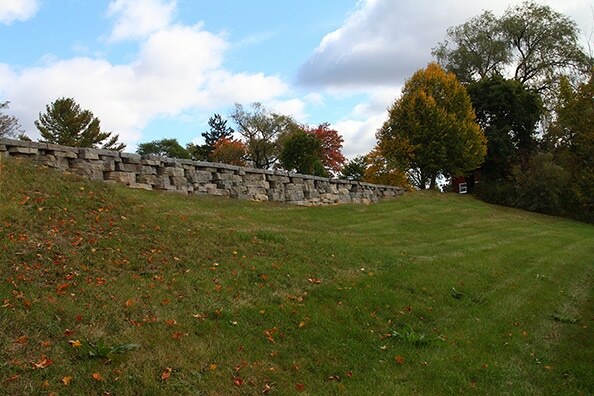 The wall was built using Rosetta outcropping blocks, manufactured in Gardiner, NY. Though made of concrete, their naturalistic texture makes them a durable and aesthetically pleasing building material. The resulting wall was not only functional, but beautiful. Check it out!